Muslim-majority Asian countries are some of the only places where Iran is viewed favorably. Why? As Iranians head to the polls to select a new president, global perceptions of Iran are at an all-time low. That’s at least according to a new poll by Pew’s Global Attitudes Project, which surveyed views of Iran from 39 countries around the world and found only 20 percent of respondents viewed Iran favorably compared to 59 percent who viewed the country unfavorably. Interestingly, Iran enjoys some of its highest favorability ratings in Muslim-majority countries in the Asia-Pacific. For the countries in which Iran was viewed unfavorably, two issues stand out: its nuclear program and human rights record. On the former issue, over the past year Chinese have further soured on Iran becoming a nuclear armed power, with Beijing joining the United States, Israel, and the European Union countries in staunch opposition to Iran’s acquisition of nuclear weapons. Indeed, 62 percent of respondents in China now oppose a nuclear-armed Iran, up from 54 percent in 2012; in Russia, no less than three in every four respondents agree with the majority view of their Chinese counterparts. Only in Palestine did a slight majority (51 percent) approve of a nuclear-armed Iran. While Iran’s acquisition of nuclear weapons is widely opposed, the international community is far more divided on how to deal with Iran’s nuclear program. While solid majorities in the U.S. (78 percent), Germany (77 percent), Britain (75 percent), France (73 percent), Israel (91 percent), Egypt (61 percent), Jordan (74 percent) and Lebanon (77 percent) support further tightening sanctions to dissuade Iran from its current nuclear trajectories. Majorities in places like Turkey and Palestine oppose further sanctions. Nearly two-thirds of Americans (64 percent) and 58 percent of French citizens also support attacking Iran’s nuclear sites to prevent it from building the bomb. However, in other NATO countries—like Germany (50 percent) and the UK (48 percent)— citizens are much less receptive to this course of action. Outside the Western world there is little appetite for the military option, even among citizens who oppose a nuclear-armed Iran. For instance, in China only 35 percent of respondents favored the use of military force, compared to 38 percent who opposed it. The comparable figures in Russia were 28 percent and 30 percent respectively. Within the Middle East, however, majorities in Israel (62 percent) and Jordan (59 percent) do support the military option if necessary, but respondents elsewhere in the region expressed much less enthusiasm about military attacks. Iran’s domestic policy was also the source of much criticism around the world, Pew found in the poll. Indeed, a staggering 61 percent of respondents said that Iran does not respect the personal freedoms of its citizens, as memories of the brutal government crackdowns on the “Green Movement” following the disputed 2009 presidential election continue to shape perceptions of Iran. Only Pakistan represents a clear majority to the contrary, while Indonesia and Malaysia follow suit in small pluralities. What accounts for this small pocket of support? The most obvious factor is that all three are Muslim-majority countries, with over 96 percent of Pakistanis practicing the Islamic faith and 86.1 percent and 60.4 percent doing the same in Indonesia and Malaysia, respectively. Still, their Islamic faith alone can’t account for their positive views of Iran. After all, Jordan and Egypt are both Islamic countries and their citizens hold extremely negative views of Iran, as seen by the short-lived thawing in people-to-people contacts between Egyptians and Iranians. The reasons why Pakistanis hold positive views of Iran are easy to discern. Despite its sometimes abhorrent treatment of its own Shi’ites, most Pakistanis have personally experienced living under U.S. sanctions because of their political leaders nuclear program. In fact, Pakistanis overwhelmingly view the United States negatively, and also have first-hand experience with U.S. military action against their country. Furthermore, many Pakistanis number one priority is greater access to electricity, and therefore likely support Iran’s dedication to building a natural gas pipeline through their country. Iran’s favorability in Southeast Asia is more difficult to explain but appears to be driven by economics as Iran, Indonesia, and Malaysia have cooperated on joint energy projects for years. For instance, in 2008 the three countries pledged to spend US$6 billion building a 300,000 barrel per day (b/d) oil refinery in Indonesia, with Iran supplying half the crude for the facility. The project has faced repeated delays. More recently, Iran-Indonesian trade flows grew by 51 percent in 2011 over the previous year, and two-way trade now tops US$1 billion annually. Notably, the National Iranian Oil Company (NIOC) has reportedly been using Indonesian and Malaysian ports to subvert Western sanctions on its oil exports. Indonesians in particular may be taking their cue from their political leaders. 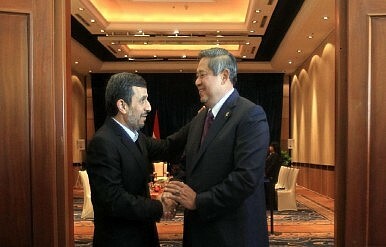 In February, for instance, Dian Wirengjurit, Indonesia’s Ambassador to Iran told reporters, “Indonesia is reluctant to comply with the oil sanctions against Iran and will not be affected by the embargos in its transactions with Iran.” Late last year President Mahmoud Ahmadinejad even visited Indonesia, where he met with President Susilo Bambang Yudhoyono. Whatever the case may be, Iran’s next president will have his hands full trying to improve Iran’s standing throughout the world, with Muslim-majority countries in Asia being a rare exception. Andrew Detsch is an editorial assistant at The Diplomat.